There is a lot of fighting in 2000's Crouching Tiger, Hidden Dragon, but almost none of the blows look like they hurt. The one really painful attack here—the one where you sort of recoil from the screen—is when one woman tells another woman that they're not friends anymore, that they could never be sisters. That's it. That's the movie's daaaaamn moment, its equivalent to John McClane walking across broken glass. It feels a bit fraudulent to talk about this as an action flick, since it's really a repression-themed costume drama with more fights than usual. But it's a really great repression-themed costume drama, and its fights are, in their own way, things of absolute beauty. There's a weird and proud tradition of great auteur-type directors deciding that they want to make an action movie and knocking it out of the park, from Steven Soderbergh doing The Limey and Haywire to Spike Lee making Inside Man. But this might be the grandest, most influential example. Taiwan's Ang Lee had been making gorgeous, Hollywood-approved insularity dramas like Sense and Sensibility and The Ice Storm, but after doing well for himself there, he decided to go back home and try his hand at one of the sweeping, romantic kung-fu sagas that stand as China's equivalent to the Western. That might've been a leap, but he found the right actors and the right fight choreographer to make it work, and he carried over the themes and ideas that had made his older work so resonant. The crucial difference, this time around, was that his struggling-against-their-prescribed-roles characters were mystic badass fighters who could fly. In Crouching Tiger's very first scene, a weathered old warrior named Li Mu Bai gives up his sword and decides that he's tired of killing. He says it with a peaceful sort of gravitas, like he knows that nothing can force him to change his mind. That fighter, it turns out, is played by Chow Yun-Fat, one of the baddest onscreen motherfuckers of all time. Of course, he does eventually return to the business of killing, as we know he will. But still, Hard-Boiled—possibly the greatest action movie of the '90s—would've been a very different thing if Chow's hero in that one had started things off by hanging up his gun and mildly explaining that he was sick of shooting this thing. Chow is awesome in Crouching Tiger. He made his name in blood-soaked gun operas, and he did those better than anyone before or since. In his team-ups with John Woo and Ringo Lam, he was Cary Grant soaring through the air with two pistols blazing. He was a stone-cold death-dealer. Whereas this movie required him to convincingly play the world's greatest swordfighter, and he did it with absolute panache, keeping his leading-man charm fully intact while radiating beatific calm and romantic longing (and rocking one of those super-long braids). He has to give a change-your-life pep talk while swordfighting through the tops of swaying trees, and he has to do it while actually swordfighting in those trees. I can't imagine how hard the job must've been. He nailed it. Michelle Yeoh, his opposite here, is equally great in a lot of the same ways. She gets more fight scenes than Chow, and she shows real fire in them, while still giving the impression that she knows she shouldn't be showing that fire. And as a lady who can kill at will but can't confess to being in love with someone, she brings a ferocious dignity. Both Chow and Yeoh had been trying to break through in American movies for years: She served Bond Girl duty in Tomorrow Never Dies, and he made a sad echo of his Woo movies with The Replacement Killers. But they both found their greatest crossover success with this restrained and pretty kung-fu opera. Funny how things work out. But the real star of Crouching Tiger is Zhang Ziyi, crazy young and getting her first real starring role. Hers is the only character with a real arc: She has to be crazy and playful and enraged and in love and strung out and finally noble. She has to exult in her powers, and she has to be a little afraid of them, too. She has to beat up a whole restaurant full of fighters wielding weird weapons, without breaking a sweat. (Confidential to the hulking twins with the big metal clubs: You are still my favorites.) And she has to play someone who can fight, and beat, Michelle Yeoh in full eyes-blazing avenger mode. Zhang went onto become one of the biggest stars in China after this; she should've also been one of the biggest stars in the entire world. Crouching Tiger was a surprise hit in America, from the nine-figure box-office draw to Best Picture Oscar nomination. It kicked off a mini-wave of arty and sweeping martial-arts operas, many of which (Hero! House of Flying Daggers!) were great in their own right. It got Lee the Hulk job that he spectacularly bungled, even if his version of a superhero epic had way more ideas than anything the Marvel or D.C. factories have cranked out lately. And finally, the one thing most people still remember about this movie: the wirework. Whenever it comes time to fight, the characters totally shed gravity and go soaring across lakes or rooftops. That technique had been a staple of Hong Kong movies for years; you can see Yeoh do great and weird things with it in The Heroic Trio, for example. Yuen Wo-Ping, maybe the greatest fight choreographer ever, put together the duel scenes here, and he put a premium on grace rather than impact. 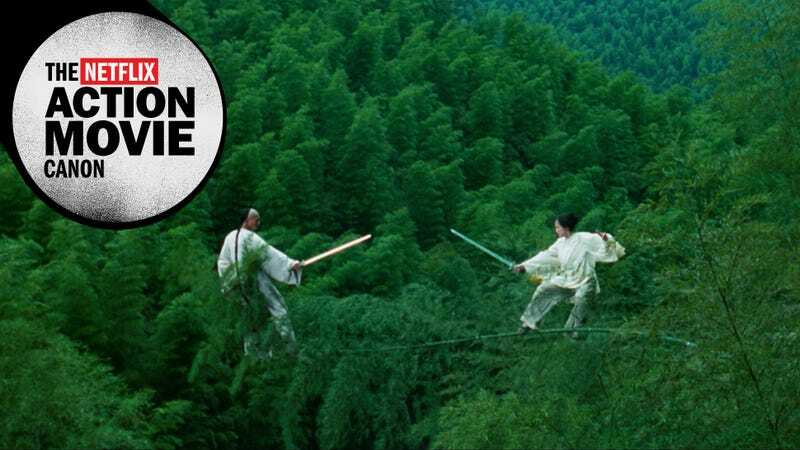 Watching it years later, Crouching Tiger couldn't be any more out of step from the gritty, low-budget action movies of today, but its fights still work beautifully with the glassy, still tone Lee was going for. You don't get the classic spak sound effect every time a blow connects; instead, robes and swords whisper through the air, and music softly thrums underneath. The fights don't get your blood pumping, but they're impressive and pretty and weirdly soothing. Later this year, the Crouching Tiger sequel will go direct-to-Netflix, the first feature film ever to do so. Chow and Zhang won't return, but Yeoh will; Donnie Yen, maybe the greatest movie star in the world today, will step in as her male lead. Ang Lee isn't involved in any way; instead, Yuen Wo-Ping is taking over as director. He's made great movies, too—the original Drunken Master, Iron Monkey, True Legend—but you don't typically think of them as art films. I don't know if he'll be able to replicate the feel of the original, and I don't know if he'll even try. But nonetheless, it's a good time to take another look at Crouching Tiger, Hidden Dragon. It holds up. That "we're not friends" speech still stings.